“Follow my example as I follow the example of Christ” (I Cor 11:1 NIV). We tell our children to be honest, and punish them when they tell lies, but how can we expect them to be honest unless we ourselves are an example to them? The best gift you can give to your children is your good example. When a young rose plant is tied to a stick, it helps the plant to grow straight. Afterwards you may remove the supporting stick; it will continue to grow straight. But if the young plant is not tied to a straight stick in the beginning, later on it will be too late to help it and the rose plant may grow up crooked. 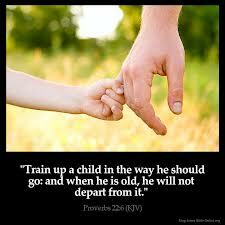 “Train up a child in the way he should go and when he is old he will not depart from it” (Prov 22:6).